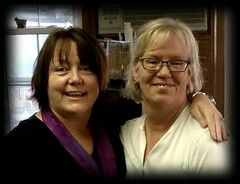 You will not believe who stopped by the shop on Saturday ... California Connie! Connie and I go way back, but I didn't realize how way until I did a search for her name on my purlingswine/wordpress site. 2005! I suspect that if I could find my original Typepad site it would be even further. Five + years and five years full of big changes! It was so great to meet Connie in person - it is a funny experience to catch up with a friend you've never met and one that sounds exactly like your cousin Barbara! The Blog, The Blog and how it's changed my life. We all have said it over and over, yet it never ceases to amaze - blogging has enriched my world!